By the burning of my thumbs, Something saucy this way comes. Pièce montée means 'mounted piece.' A croquembouche is an assemblage of pastry cream filled puffs held together with caramel or chocolate sauce. Unlike mine, they are usually formed into a high, conical shape and served at weddings and baptisms in France. The May 2010 Daring Bakers’ challenge was hosted by Cat of Little Miss Cupcake. 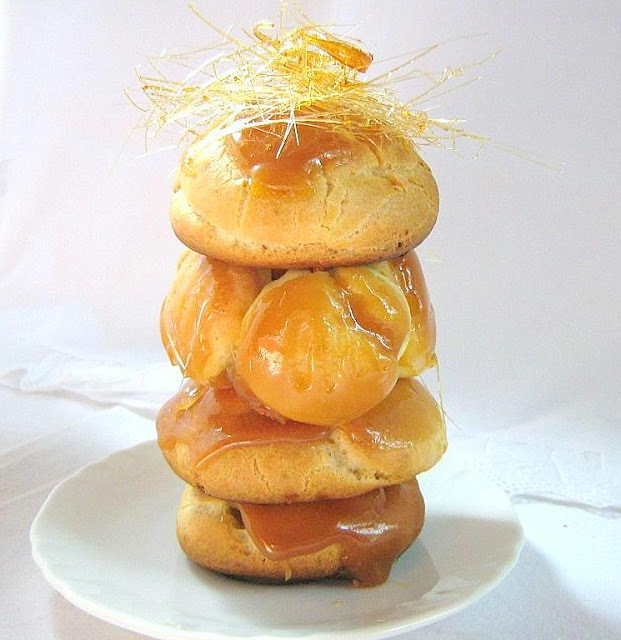 Cat challenged everyone to make a pièce montée, or croquembouche, based on recipes from Peter Kump’s Baking School in Manhattan and Nick Malgieri. Thank you, Cat. Despite everything you had going on, you were an excellent host. 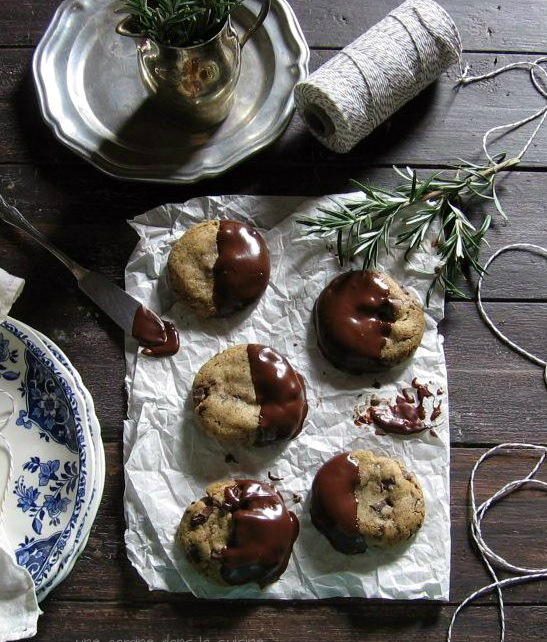 In baking, as in sports, one usually performs better when they are faced with a tougher, more worthy opponent. It forces us to summon all the skills which lay dormant during the easier tasks. This is one of the many reasons why I joined the Daring Kitchen. It pushes me to be better. I have always had a hard time making crème patissiere and custards. They almost always end up looking like cottage cheese. During this challenge, the pastry cream took on an unexpected yet equally frustrating manifestation, lumpy crêpe batter. The second attempt was much more successful. And, for the first time, I made gorgeous, silky pastry cream from a recipe that didn't come from Dorie Greenspan. Believe me, that's huge! There were a few more snags. Because I was worried about not having enough pastries, my pâte à choux were very small. This caused an engineering dilemma. Sublime in their rich, delicate hollow mounds, they were too tiny and round to support each other. I only managed to build one mini pièce montée, and it had to be held together with massive amounts of toothpicks and hope. Then along came my fair-weather friend, caramel. The caramel sauce acts as a glue and fingerprint burner. I have made it several times and every recipe is a little bit different. This one didn't like me, nor did it like my stove (though in all fairness, I've got issues with it too.) As soon as the sauce reached the perfect colour, I placed the pan into an ice bath, whereupon it transformed from a sauce into a hard, sticky, impossible to clean circular layer of anger. But I did manage to pull up a little bit of spun sugar. I remade the caramel and added some corn syrup and cream. It felt like I was cheating but at that point I had a lot of questionable pâte à choux and soupy pastry cream so I didn't brood too long over the ethics of my technique. The next tricky part was actually making more spun sugar. In my numerous attempts at achieving the perfect caramel over the last several years, I have mistakenly produced spun sugar about 80% of the time. So I didn't think it would be that difficult *wa wa waa* I did manage to produce what was possibly the best caramel sauce I've ever made, of course after I had already dipped the pastries into the other one. The 2nd time was the charm in this challenge. On take take #2, the sugar dripped from the whisk like spun gold. I only wish I had more dessert to decorate it with. Continue whisking (this is important – you do not want the eggs to solidify/cook) until the cream thickens and comes to a boil. Remove from heat and beat in the butter and almond. 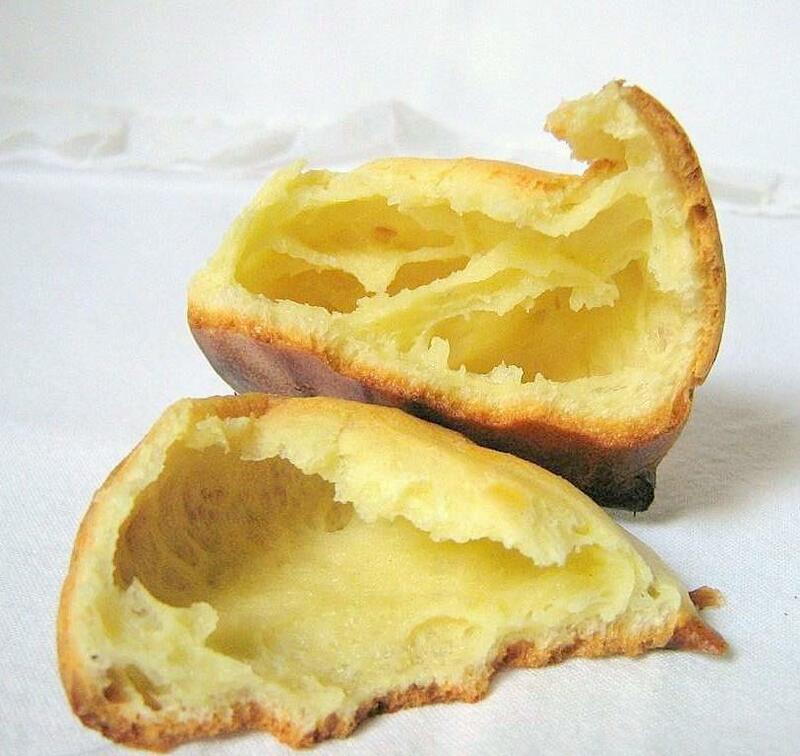 When you are ready to assemble your pièce montée, using a plain pastry tip, pierce the bottom of each choux. Fill the choux with pastry cream using either the same tip or a star tip, and place on a paper-lined sheet. Choux can be refrigerated briefly at this point while you make your glaze. Beautiful piece montee! That golden spun sugar looks gorgeous! Ciao Valerie ! After all these burns I might go simply chocolate !! i'm putting it together tonight ! You mini piece montee is a mini-masterpiece! I was not brave enough to even attempt the spun sugar, but your creation makes me want to have some of my own! Amazing work, even through the frustrations and complications!! Very well done! 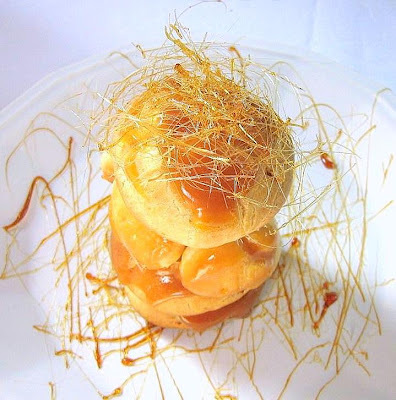 Your croquembouche looks beautiful! 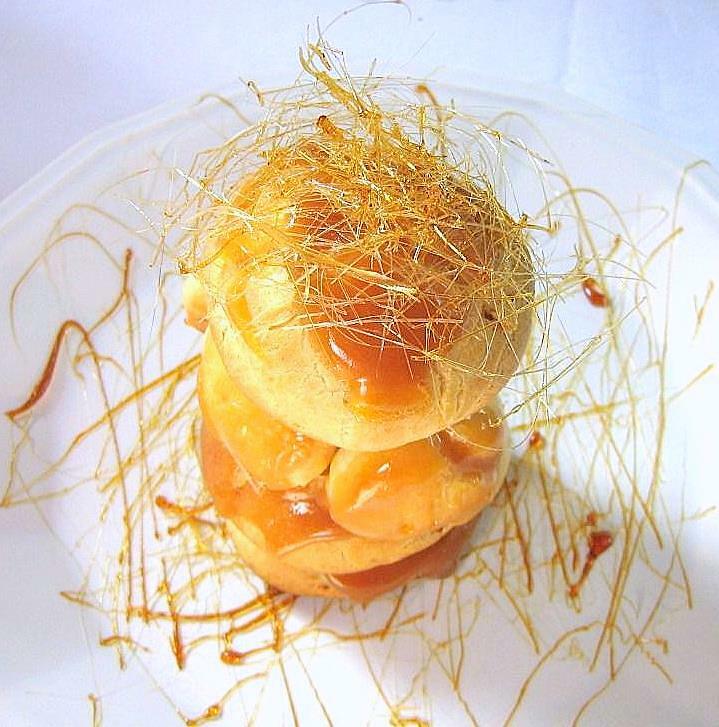 Despite all the "learning", your mini Croquenbouche looks so delicate! Great job! Hey Valerie, pretty! Your Montee has a very different style than others I've seen, and it's a good 'different'. I think your croquembouche is adorable, and I wouldn't want to share it with anyone else! The spun sugar looks amazing. I also made spun sugar by accident, but didn't have time to play. I plan to put spun sugar and corkscrews on the next thing I make, however inappropriate! Great Croquemboche! Certainly some work assembling it. Good job! I hope the burnt fingers were worth it. The spun sugar looks lovely. I was too chicken to try it, but now I wish I had. Great job Valerie! My, what we bloggers go through to hone our culinary skills! With all the grief, you did an amazing job. I so love cream puffs and haven't made them in years. You've made me hungry for them. Many foodie dreams are built on toothpicks and hope - beautifully done! Your croquembouche came out great. Nice with the almond creme. Love your tower, fun and different. 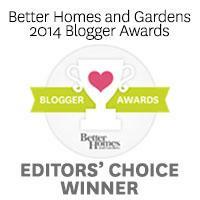 Congrats!